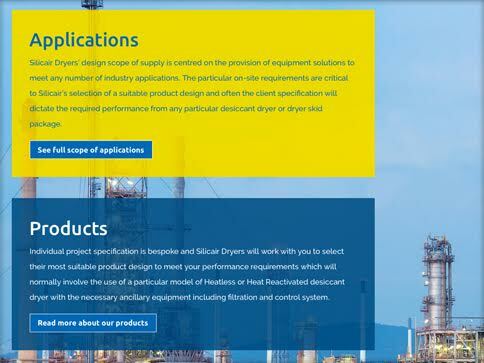 Silicair Dryers are one of Europe’s leading designers and manufacturers of industrial drying solutions. They have an international client base and their new website forms the cornerstone of their current marketing strategy, which has already attracted new prospective customers. Space saving modules and functionality have been employed to present the data-heavy content in a clean and efficient manner, improving user experience both on desktop and mobile devices. New branding, also created by Raphael Design, has been implemented throughout the site. A range of product data sheets, incorporating this new corporate look, has been created as part of the project. These are available on the website from a downloadable PDF library. 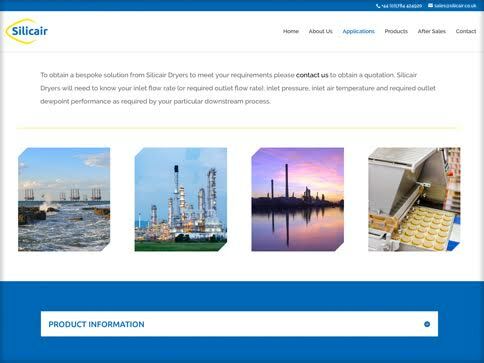 Stock imagery has been sourced for use on the website, which is sympathetic to the industries that are Silicair’s target markets. These added visual interest to the site.